Here is my homemade recipe for Chicken burger patties prepared with ground chicken meat and spices . Chicken burgers are so lovely and filling meal that can give us a joyful treat in each bites. It is not practical to have this junk food on a regular basis, though it is delicious. But, it is possible to make chicken patties or burger patty at home with handy ingredients in our pantry. 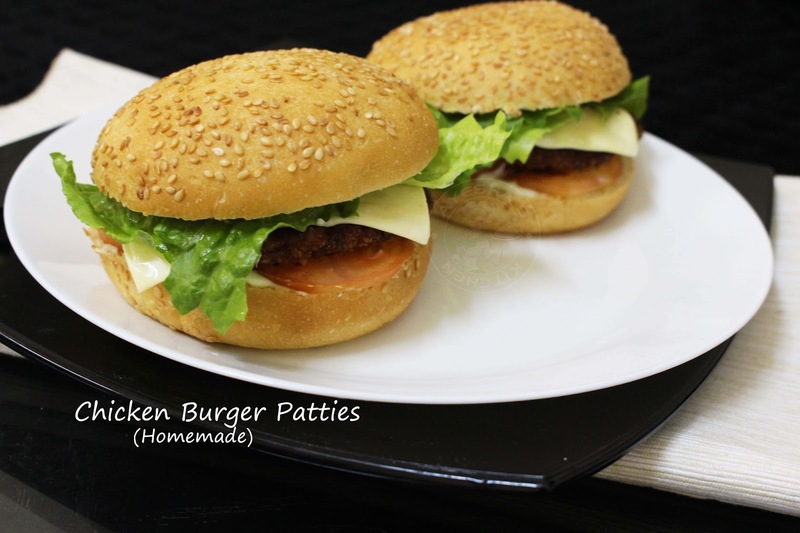 This juicy chicken burgers sandwiched between burger bun is a must try recipe for a quick dinner meal. I bet, you will never go for a store bought burger patty once u try this recipe. As chicken is a staple food, i prefer chicken burger patty recipe than a beef burger patty recipe or fish burger / fish sandwich patty recipe. I love making this for dinner and sometimes as a lunch sandwich. Ingredients for this healthy patty recipe are quite simple. Moreover it is very healthy when compared to store bought frozen burger patties. This homemade burger recipe with minced chicken is a perfect no fail recipe with step by step pictures of making. 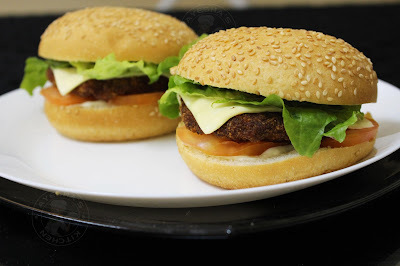 Hope you all will try this burger patty recipe and drop your feedback in the below comment box. 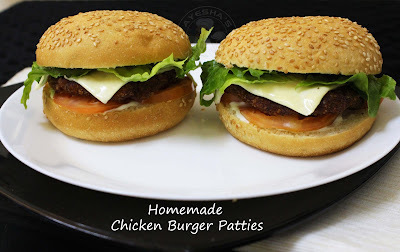 Here is the recipe showing how to make homemade burger patty recipe / homemade burgers /easy burger recipes / healthy chicken burger patty recipe. Cut the chicken breasts into small pieces. Now we have to mince this chicken chunks. Pulse it in the blender for few minutes. Do not blend more. To this minced chicken, add soy sauce, pepper powder, oregano, salt, garlic paste and give a fine mix. It will be sticky, but do not worry. To this, add the cornflour and again combine with a spoon. Now add, oil to the mixture and make a medium sized balls. You can grease your palms before making balls. Now take a greased round shape (a small lemon sized) and press the burger patty inside it and then shape it round. Take it out and dip it in the bread crumbs and then flatten within your palms lightly. You can make the burger patty thin or thick. I prefer thin patty. Chill for 15 minutes. Now take a frying pan and heat the oil for deep frying. Once hot, make the flame to medium low, add the patties, flip in between and fry both sides( If you fry in high flame, the sides will get burnt leaving the middle part uncooked ). Drain it and set aside. Take your burger bun. Toast them lightly in a pan or oven for a minute. Spread 1 tsp of mayonnaise on one side. Place the tomato slice over it, top it with homemade fried chicken patties, spread some tomato ketchup, place cheese slice and top it with lettuce. Cover it with the other bun slice. Serve and enjoy.